This one is less a creature and more a deity. Dagon is the ancient Philistine god of corn (fertility) and fish (multiplying). 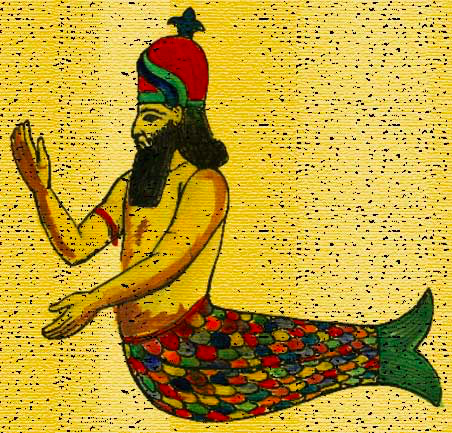 He’s merman who’s all about grain–and his rather cool hat. His name in ancient Hebrew means corn. Later he became a fish or fishing god (possibly because of misinterpretations of ancient texts) is now more popularly known as Dag which means fish. Corn. Fish. Corn. Fish. Either way, he’s all about fertility and multiplying. Did I mention that he’s a merman with a colorful tail? Are you participating in the A to Z Challenge? If so, be sure to let me know in the comments. Do you know of other half fish deities? Have you ever wondered why these creatures have never been depicted with the head of a fish and the legs of a human?